That one passage from Dr. Vieira’s book goes to the most central hope for undoing the tremendous damages to America done in the name of the so-called “War on Terror”. All Oath Keepers should bear in mind that power-mad politicians on both sides of the aisle have always sought to increase illegitimate government power by crying “Emergency!” Yes, there can be “emergencies”. But No, the General government in Washington D.C. (WDC) does not gain some magical new power to attack our Bill of Rights just because an emergency occurs. If – for example – in a hypothetical situation in which unscrupulous politicians and government officials wished to involve America in an otherwise neutral war somewhere, or if they wished to exercise more control over the behavior of society, or if they wished to install a military-police state under martial law in America, or if they wished to take America fully into a one-world government via the United Nations, their first choice of excuses would be to cry “national emergency”. Peak events of Twentieth Century America show this clearly. The notion that some emergency of some kind somehow suddenly suspends the Constitutional way of setting policy in a branch, department, or agency of the General government in Washington D.C. (WDC) is used to justify a violation of Constitutional law by those foresworn to uphold the law of the land. As the Constitution is the nation’s founding legal document, all law must meet Constitutional standards to exist as “law”. Dr. Vieira points out the obvious but often overlooked reality: The concept “Emergency” cannot exist lawfully at the General (Federal) level. Tenth Amendment: If it’s not granted or enumerated, it is reserved to the States or to the People, with the People being the source of authority and legitimacy, granting an individualized portion of each citizen’s personal sovereignty to animate the offices of the General government. If an “emergency” exists, it is to the States affected locally by the emergency to handle, and their structures must also be in accord with their respective State Constitutions. It’s to the States. Some say – “When spying is done without warrants, concern is warranted.” The only thing warranted in all this warrantless spying on the American people is concern. The fact that the NSA is doing this to the American people is remarkable. Regarding such activity being conducted outside the U.S. A., I’m not sure of course, but I imagine that the average Brit or Spaniard or Italian or German or anyone in any other country might also resent this kind of global snooping. Let us remember, this spying by NSA is a world-wide human info trap. From Wikipedia we read: On December 23, 2005, the Austin American-Statesman reported Tice’s allegations that spying on Americans may involve a massive computer system known as ECHELON, which is able to search and filter hundreds of thousands of phone calls and e-mails in a matter of seconds. But now, suddenly, because Mr. Snowden allegedly provided two newspapers with the actual paperwork which proves our deepest fears, everyone knows the NSA has been dragging in all of our communications and storing them for future reference. The NSA is screaming that they were not “reading” our mails or “listening” to our conversations on the phone – oh no; they are just “collecting” them for future reference. The NSA sees nothing wrong, immoral, or illegal about collecting your and my communications without asking permission or without getting a warrant based on probable cause. The NSA has no problem with keeping that kind of criminality ‘secret’ from “we, the victims”. My question on that count is if the NSA will knowingly violate my Fourth Amendment right to be secure in my individual life as an American citizen, why should I believe them about anything else they may proclaim? The NSA is publicly denying that they are reading our communications, yet we’ve got the proof that they were doing that as far back in time as 2005, eight years ago. This time, thanks to the way Snowden did his handiwork, it’s all over the news and can’t be stuffed back into the bag. The NSA wants to be able to “data-mine” every American’s phone calls and emails and lots of other personal stuff such as medical records, military service records, consumer records, credit ratings, book purchases, ATM withdrawals and banking records, criminal records, financial portfolios, groups or organizations to which one makes donations or contributions, vacation destinations, education records, employment records, air, ship, or train transportation records – in a word, everything about us. The NSA wants to data-mine all that for up to five years back into the past. In other words, what you said on the phone five years ago would be minable by NSA today. Like, as in, everything you have said online or on the phone for the past five years. Especially, who your friends are, or, as they put it, to whom one might turn, or run to, if one needed help. They are doing this on each and every one of us. All the time. And not only did they not ask our permission, they tried to keep it secret from us. National Security, and all that jazz. Now they’re trying to sell the American people on the sham story that it’s somehow “legal”. It is unlawful for the General government to surveil American citizens without a warrant issued upon probable cause. The “legal” framework, including whichever Executive Orders or National Emergency Orders or Presidential Decision Directives or whichever other concoction “legal teams” working for the General government come up with, is null and void on its face as soon as it tampers with one of the Bill of Rights Amendments. The reason? It contradicts and violates a higher law, the great law from which all subsequent laws must derive their legitimacy – the U.S. Constitution. This impersonal spying has got a lot of folks upset, with good reason. It is rude, offensive, and very un-American. Worse, it is un-necessary and is part of a concocted fraud, a man-made “myth”. The fraudulent myth is the alleged “War on Terror”. We cannot truthfully say that America is involved in a “War on Terror” when our President gives arms and ordnance to al Qaeda in Egypt and Libya and is now arming and supporting al Qaeda in Syria. We are either at war with al Qaeda (allegedly the most organized and powerful terrorist group on earth) or we are not at war with al Qaeda. If we are at war with al Qaeda, then the President of the United States is guilty of international war crimes and treason – for arming known terrorist organizations. But since the Congress, whose job it is to check and balance the operations of the Executive Branch, sees no reason to indict the President on treason charges for arming the world’s most deadly terrorist organization, then we are forced to admit that there is not really a “War on Terror”. Therefore, any infringement of, incursion into, or denial of any part of the Bill of Rights, is a violation wanting justice; and furthermore, any curtailment of American liberty in the name of the alleged “War on Terror” is criminal. James Bamford  is the author who brought to light the now-infamous “Northwoods Document”. He is also a favorite author, having written the definitive tome on the NSA – Body Of Secrets – and the more-recent “The Shadow Factory”. Bamford is also the guy who fingered the NSA’s massive Data Center in Utah, which is another centerpiece in this collage. Now James Bamford has a new article published over at WIRED. It will not offend if you take pause here and go to WIRED’s site and read Mr. Bamford’s masterpiece. End Quoting. 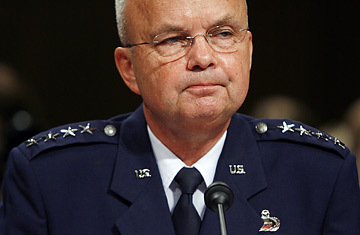 The four-star General who runs the US Cyber Command thinks that the benevolent government “is going to have to step in”. This is one of the guys who is in charge of collecting up all of your and my phone calls and emails and Internet postings and all the other stuff which is now being fused into bulk data troves to be stored in Utah for future data mining. ← The Daily Bell Interviews Dr. Edwin Vieira, Jr.